Marques de Valdueza Spanish Olive Oil is made exclusively from the highest quality olives from the Perales Estate near Merida. 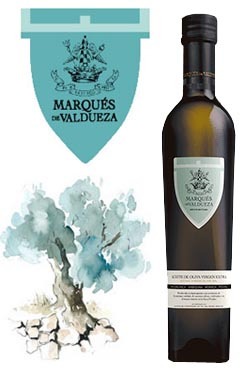 Marques de Valdueza Extra Virgin Olive Oil is a blend of Arbequina, Picual, Hojiblanca, & Morisca olives, giving Marques de Valdueza olive oil its own unique style & characteristics. Produced in small quantities & pressed within hours of hand-picking, Marques de Valdueza Extra Virgin Olive Oil has a unique style with an excellent fragrance & fresh fruity flavor with just a bit of pepper. Marques de Valdueza Extra Virgin Olive Oil.